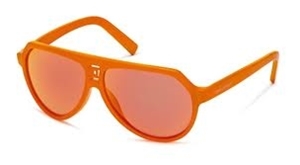 42G - Neon orange frame and orange mirrored lenses. The Dsquared2 DQ 0093 is a unisex plastic aviator which features the Dsquared logo at the bridge, and the name on temporal part of the arm. The sunglasses are part of the 'neon collection'. Each Dsquared2 DQ 0093 sunglass comes with its own branded case, cloth and packaging, and covered by the 12 month no quibble sendoptics guarantee. 75Z - Neon pink frame and pink mirrored lenses. 93Q - Green frame and emerald green lenses.